I do not know anything about today’s old house photo other than it is AMAZING and appears to be on “Prospect”. A planbook design? Or maybe I’ve posted something similar. I’ve been taking a break with shares for nearly a month and decided it’s going to be a while longer. I will keep posting fresh posts each week so continue sharing and chatting for each other. Please resist emailing them to me as I get so many it’s difficult to keep up. Besides Cora it’s just me and it’s overwhelming at times on everything that needs to be done behind the postings. Remember to include the price, build date and city/state if it’s not shown in the link. What a lovely formal “Free Classic” Queen Anne style home. Prospect was a very common street name in the Victorian era. The term was also used to describe a higher elevation with a picturesque view. Part of the Victorian artistic ideal of the picturesque suggested that grand homes looked best when they prominently sited as on hilltops and rises. Summit Avenue in St. Paul, MN. was intentionally selected and developed for high end residences because of its overlooking views. I would expect that this home was built between 1895 and 1905 as it embraces Colonial/Classical Revival stylistic elements such as the tripartite Palladian windows with Colonial style muntins and a rooftop Colonial rooftop balustrade borrowed from Georgian architecture. There are numerous dentil blocks, another Classical motif, as well as Classical columns and capitals. Applied (stuck on) plaster swags and garlands were derived from designs by the Scottish Adams’ brothers, mainly Robert and James. In the 1750’s they toured ancient ruins in Italy and the Adriatic region to make sketches of designs from Classical antiquity. These design ideas were later brought to Colonial America and remained popular through the Greek Revival period. (1820’s-1840’s) Queen Anne style houses were also inspired from English prototypes but they seldom employed a wealth of Classical details until the faux marble Great White City opened as the World’s Columbian Exposition in 1893 Chicago. One of the dubious characteristics of the Queen Anne style before Classical influences took sway following the 1893 exposition, was the absence of a formal common design vocabulary by American architects. Critics condemned Queen Anne design as a non-style where anything goes. 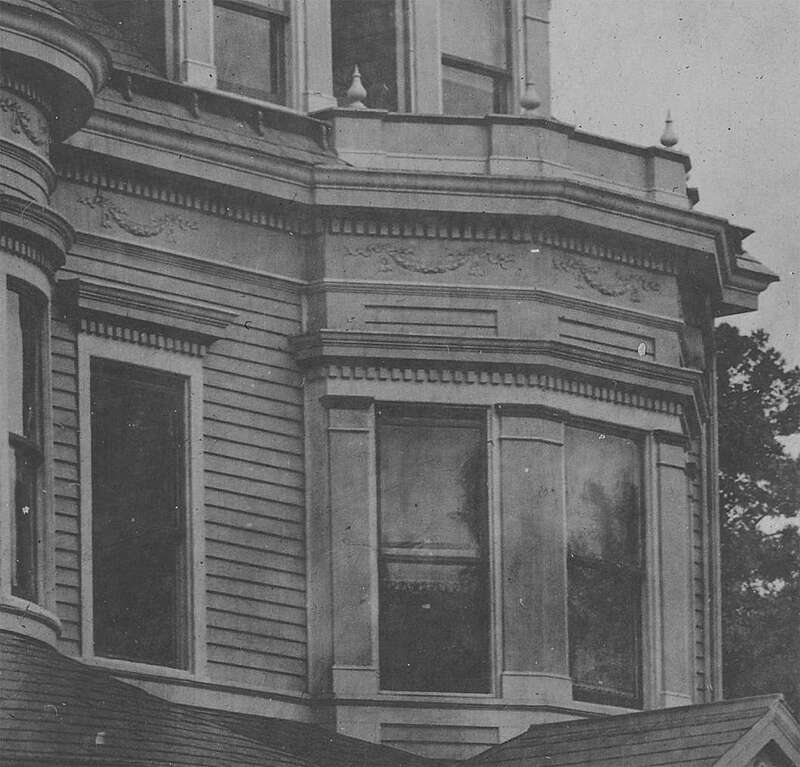 Between the Queen Anne style’s introduction in the mid-1870’s until the 1893 Exposition, homes built in this asymmetric style were often eccentric, rambling, and organic. 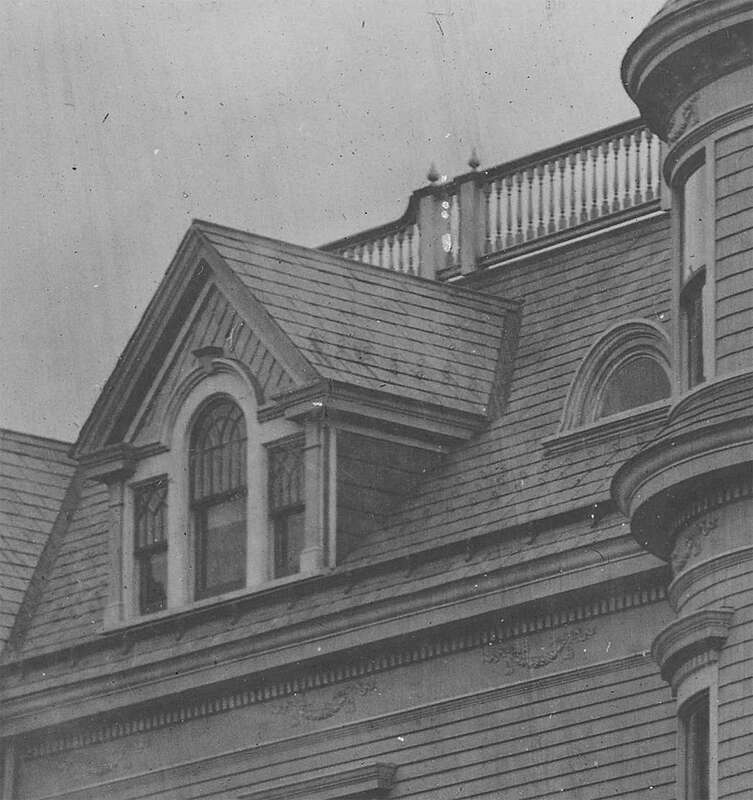 Towers, turrets, roof sloped “eyebrow” windows were common. The overall effect of earlier Queen Anne mansions was restless and in some examples, almost frightening. 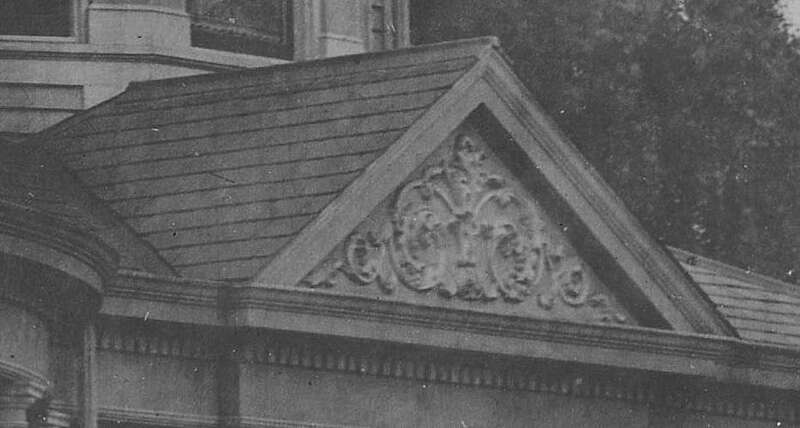 When Classicism took hold in the mid-1890’s, architects sought to “tame” the unruly Queen Anne style by incorporating formal Classical details as seen in this house on Prospect street, located somewhere. Where quirky individuality of design was formerly a common design trait of the Queen Anne style, conformity took its place through the use of Classical/Colonial details. After 1900, Queen Anne homes became increasingly less ornamental and finally lost their stylistic identity just before WWI. I believe this house was probably built in the final years of the 19th century because of its abundance of ornamentation that it still has. To my eyes, it also seems to have more of an East Coast look although I also recall seeing a Colonial Revival style home in Prescott, Arizona, that would look right at home in Boston or Philadelphia. Mass media published in the 19th century greatly helped to bring conformity across the country by showing what was popular in eastern population centers. In summary, I truly like this late example of the Queen Anne style. It still retains some of the asymmetry of the earlier Queen Anne style as well as some of the dignified Classical formality introduced in the mid-1890s. I can only hope it has somehow survived but the chances are slim. Thanks for sharing. Thanks for the kind words. I do not have a blog but I do have a Yahoo (inactive) Victorian architectural discussion group called the Victorian Architectural Revivew or “Vicarr” for short which I started back in early 2001. At its peak about a decade ago, there were several message posts a day but as of late, some months are skipped without any postings. I probably should try to revive it by posting more but finding the time and motivation are challenging. I do maintain a FB account under my own name and from time to time I post old house themed information. I also have a just over 2,500 count photo collection of old house photo albums compiled from many road trips over the years: https://www.flickr.com/photos/11236515@N05/albums As of right now, I’ve had well over 2,000,000 views but hardly what anyone might call a “viral” phenomenon. As I think most are aware, I do post frequently on Old House Dreams because its such a unique old house blog. Reader sharing and participation make OHD different from other old house sites. I appreciate that privilege. -If you were to post the comments that you have made about Victorians on OHD on your Victorian Architectural Review site, it might revive it and generate comments on both. The Review site would be likely to get more hits from people, which would generate comments and it could snowball. -I suggest this because your comments here are so cogent. I am so ADD that studying something in an organized way is beyond me, but through comments like yours on OHD, I have painlessly learned a lot. Your voice is heard here, yet your own site would be a valuable resource for me. – An example of the type of thing that you comment on has had me wondering this week. I have been carrying on. back and forth comments with the recent purchaser of Balloon House, a Second Empire manse that reminds me of a house posted this week. To me, there is typical style for stair rails balusters, banisters, and molding around each step that seems to be shared by Second Empire, Italianate, and Gothic Revival. The owner of the house refers to it as Victorian. Although she was the queen from 1837 to 1901, the Victorian furniture period starts around 1860 as the American Empire style went out of fashion. Here is my question. -Are the three house styles that I listed above above considered to be Victorian, like the Queen Anne, or do they stand apart? Thank you Joe for your great comments and suggestions. Victorian is a generic term that most closely refers to architecture built during the reign of Queen Victoria from 1837-1901. There’s also an ambiguous term I’m not especially fond of, “High Victorian”, which as best as I can ascertain, simply means a fancy house usually dating from about 1870 to 1890 plus or minus a few years. You are absolutely correct in that interior house parts (doors, stairs, newel posts, door and window trim, mantels, and more) are products of their time. Thus it is unlikely that a rocket ship shaped Italianate newel post would appear new in a lavish Queen Anne style home from the mid-1890’s. People followed popular trends even in the 1800’s. Although we did not have HGTV back then, we did have a wealth of printed and published media that helped promote new designs and styles across the nation. As for “Second Empire”, it is a modern term used to describe Victorian era (1850’s to 1880) homes and buildings featuring Mansard roofs. In all other respects, except for the unique shaped roof, Second Empires are interchangeable with the very popular Italianate style homes of the same time period. The style name comes from the reign of Napoleon III (according to Wikipedia): “Napoleon III was the first elected President of France from 1848 to 1852. When he could not constitutionally be re-elected, he seized power in 1851 and became the Emperor of the French from 1852 to 1870.” Thus Second Empire refers to the Second Empire of France after Napoleon Bonaparte’s failed First Empire. Contemporary architectural publications in the 1860-1880 period often called these houses French style or Mansard style. 20th century academics changed the style name to Second Empire. Some informally refer to the mansard style as “The General Grant” style because the peak of popularity in the U.S. was during the administration of U.S. Grant, 1869-1877. The Italianate style stretched from the 1840’s to about 1890. It was hand’s down the most popular of all Victorian styles and was brought over from Great Britain being inspired there by the picturesque old Villa’s of Italy and Tuscany in particular. In summary, Second Empire, Italianate, and Gothic Revival are all legitimate Victorian era house styles. Thus, your Balloon House owner has a Second Empire style home if it has a mansard roof. One last item worth mentioning is that after these styles were well established, some creative architects arbitrarily combined details from different styles to create hybrids and its best to call these houses “Eclectic” stylistically because they are not pure versions of any particular style. As you can see, I own a house west of you in Strawn. I very much want to find out more about my house and what it might have looked like when it was first built. I know who built the house and the family owned it until the late 60’s I believe. My question to you is, how do you find out so much about the history of houses? Is there a way that I might find some old photos of the house or maybe even an old floorplan or architect’s drawing? Any suggestions you have would be great!!! Strawn, a small community of about 700 in Palo Pinto County, was founded by Stephen Strawn according to one historical account. The Texas & Pacific Railroad crossed into Strawn in the 1880’s as it pushed westward. As of 1891, Strawn had 400 people. Like serveral other towns in the region (Mingus, Thurber, Mineral Wells) a population boom occurred in the teens due to coal, and later, oil and gas deposits in 1915 so that by 1920 the population was almost 2,500. A steady decline afterwards took the small town to a population low point in the 1980’s but it has since regained slightly. Here’s an article (by the late Pete Charlton, a Fort Worth historian) which mentions some Strawn data like a 1928 plat map as well as mention of a museum in the town: http://fortworthgazette.blogspot.com/2011/01/strawn-palo-pinto-mountain-city-with.html There is also a Palo Pinto County Historical Association: https://www.palopintohistory.com/ I would think that for concrete evidence of the history of your home, a search in the county courthouse deed records would probably show a succession of owners going back to the founding of Strawn. Between these sources, surely the information you seek should be found. Once you have an original family name, Genealogy sources can help provide more information about the people who lived in your home. Curiously, one online source about Strawn included a single post (2007) from a direct descendant of Stephen Strawn offering some early papers related to the town: “Dear TE, I understand that my great-grandfather was Stephen Strawn who founded [Strawn, Texas]. My uncle took some photos of Strawn in the 1950’s when he visited. (I have them somewhere.) I also have some documents on the Strawn family and wonder how I might get in touch with someone in Strawn, Texas? My letter attempts in the 1980’s went unanswered. I wonder if any Strawn relatives still live nearby to the town. They might be interested in copies of the family documents I have. – Stephen Strawn, Humboldt County, California, March 22, 2007” It would be very interesting to know if Mr. Strawn was able to provide copies of family documents to the local museum or not? Such collections are sometimes gold mines of early history in a community. Please feel free to follow up should you have any questions-I’d also be interested to know what you find if you wish to share. Thank you for your reply John. I actually do know quite a bit about my house’s history. I know who all of the owners have been in its lifetime. I did a genealogy search on the family and know where they all came from and that various relatives lived in Strawn at times (and even in this house as well). The man who built the house was a successful wildcat oil driller and we found a lot of his business records that had been left behind hidden away in the house. This is actually a very well known house in town and lots of people remember playing in the house as kids; jumping out of the second story sleeping porch on to a matress on the ground! The house was remodeled quite a bit around 1960 and there is no one left anymore who remembers what the interior originally looked like. Are there ever blueprints included with the original papers recorded in a courthouse? I guess that’s what I am ultimately wanting to find if I can. I am ashamed to say that I have not yet gone to the Strawn Museum. My husband is on the BOD of the Strawn CofC and wrote a grant that helped get the museum funds for some repairs and remodeling, so guess I’d better go, LOL! There may be some pictures of the exterior there. So far I have not found any pictures of the house. I have read the newspaper article that you so graciously linked. The first four photos are of a place that is owned by some very good friends. It is called Zims and was originally an early 1900’s Dr Pepper bottling facility. “Zim” built a travel court when the Bankhead Highway came through Strawn and had a small lunchroom, bar and dancehall as well. Our friends now serve a brunch on Sat. and Sun. and you wont find better food anywhere in Texas, Please drop by if you’re ever in the neighborhood! The fifth photo in the article shows the old Bankhead Hotel. Our house is just barely out of the picture to your left. You can see some of the trees in our yard, ha ha! The old Strawn map is interesting. It’s surprising to see how many streets have been renamed since then, mostly after prominent Strawn citizens. To answer your question about floor plans or blueprints, very rarely will deed records have any copies. A local title company if it has been around for a while might have archived copies. As for older exterior views of your home. I think your best chances of finding a photo would be at the local museum. I was surprised to find an old Dr. Pepper bottling plant still standing. Perhaps Dr. Pepper became the (official?) state beverage of Texas is because they long ago set up small bottling plants in smaller towns as part of their business model. The bottling plant in the town of Dublin, Texas, opened in the 1890’s and over time became justly famous for its longevity until the parent company decided to disallow continued production of Dr. Pepper at that location. It is my understanding some small scale production of other branded soft drinks continues at the Dublin facility. Despite the fading of Strawn after the WWI era energy boom passed, a look around in Streetview shows it has signs of life and the town’s business district seems vibrant: https://goo.gl/maps/p7JzRWExSkC2 (unusually complete for such a small community-some communities in the Midwest states are many, many times the size of Strawn, yet have very limited or even no streetview) In summary, the museum would likely be the best place to look-they may be able to direct you to other people and resources. Thanks to you and your husband for your contributions to preserve Texas history. Thank you for your reply. As usual, you have given me extremely useful information.Your substantial contributions to OHD have been among the many that have provided me with so much valuable knowledge about houses over the past few years. This particular reply has cleared up a lot of questions that I have had about the various styles, especially because my training is in furniture periods. -I find it amazing that, while the American Empire 1830 -1860 (sometimes called Classical) and American Victorian 1860-1900+ furniture periods are considered to be entirely different, In American houses, although there are different styles, they are all Victorian because such houses were built during the reign of a queen in another country. Anglophiles unite! -Descriptions of so much of American period furniture use the design book’s authors such as Chippendale, Hepplewhite, and Sheraton as their descriptors, whereas in England they use the monarch’s name, i.e. Georgian. The designers are secondary there. It appears to me that Queen Victoria may be the sole English monarch who reigned after the American Revolution to have her name on a period of furniture or houses. -Queen Anne houses seem to have come one hundred plus years after the revolution in spite of the fact that Queen Anne’s reign followed that of William and (her sister) Mary, while the designs of the furniture period that carries her name emerged 100+ years earlier during that reign. -I am so grateful to Kelly for creating this site where we are able to interact and exchange knowledge with each other. – A bit of trivia that I believe to be true. Empire furniture was looked down upon by the early collectors of American Federal furniture in the early 20th century because to them, it was their parent’s used furniture. In the 1990’s, when demand and prices for Federal furniture had skyrocketed, The high end antique dealers had trouble finding inventory. They had to turn to Empire furniture to have something worthy to sell. At that time the name Classical suddenly came into use for the best Empire furniture. I believe that this was a marketing ploy because there was a residual taint on the name Empire from remembered sneers of the grandparents of those collectors. -Currently Federal furniture sells for the lowest prices that I remember in my adult life. The fashion for young people has shifted. To this day, the clunky, often veneered Empire furniture popular from the 1820’s to the 1850’s is somewhat looked down upon. in the 1960’s and ’70’s there was so little demand for these items that antique dealers were ingenuously putting the veneered pieces into a vat, stripping all of veneer off, sawing off the Empire curves and then selling what was left as “Country Pine”. Of course, solid Empire furniture from the likes of Duncan Phyfe has always been collectible as are items like the elegant columned mirrored consoles which always seem to come from New York. The history of furniture in this country can also be traced according to what woods were available. Until about 1850, most furniture grade wood species were available with imported Brazilian Rosewood being the highest coveted. Black Walnut was equally popular and in some places, (like pioneer era Missouri where it was a native species) it grew so plentifully that large beams of Black Walnut were used commonly in house construction. By the late 1870’s both (Brazilian) Rosewood and Black Walnut were becoming scarce so furniture makers switched to Oak ushering in the Golden Oak era which last until about 1910. Each year after 1900, the price of Oak wood increased, especially of the quarter sawn variety. Bird’s-eye and quilted/figured Maple was introduced to compete with declining supplies of Oak. Veneers because popular in the teens and 1920’s and finally, cheap woods like Poplar and Pine, were painted in the 1920’s and sold as “Cottage” furniture. By that time, all of America’s virgin forests had been harvested so modern tree conservation techniques were adopted to help provide a limited supply of furniture grade woods. In the 1970’s, the vast equatorial Mahogany rain-forests of Indonesia and the Philippines were being clear cut dropping Mahogany lumber prices for a while due to the glut being shipped abroad. A whole industry of cheaply copying old (American) furniture in Mahogany by native wood carvers sprang up in Indonesia in the 1980’s and ’90’s. A problem with this antique looking reproduction Indonesian furniture was that it was very hastily made (don’t look for Grinling Gibbons quality) and most pieces were sprayed with a thick opaque polyester synthetic finish that seals the wood often causing the not fully cured wood to later crack and split. Today, that once abundant Indonesian/Philippine supply is declining so that furniture grade woods will remain expensive for the foreseeable future. Small wonder that most millwork trim used in today’s houses is (finger jointed) “paint grade” or even made from extruded plastic. You always take everything I’m thinking and articulate into a wonderfully crafted essay! Love reading your posts. Thanks MJG for the kind comments. I appreciate the information you’ve shared with the readers here and look forward to reading more. That’s where I know you from! Flickr. You used to comment on my photos years ago when I was restoring my old house in Connecticut. I always loved your photos. 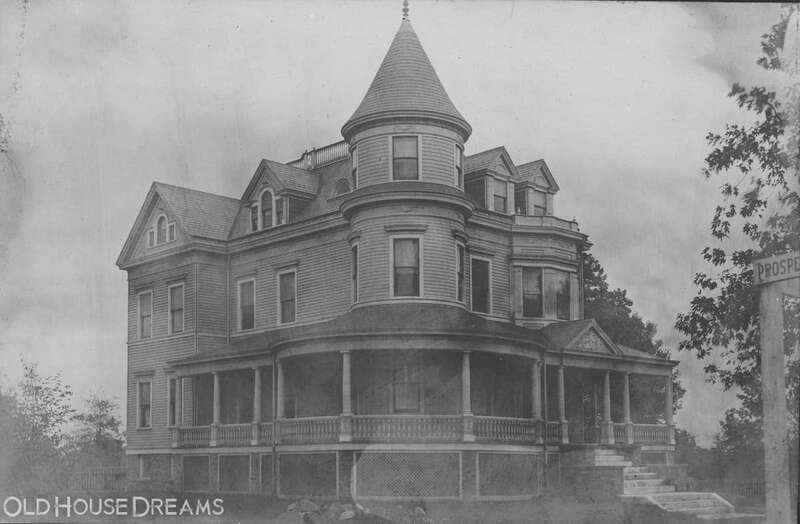 This house, the Goodholm Mansion in Oklahoma City, is very similar to this house shown. Like Kelly said, she thought this may be from a plan book, so I wouldn’t be surprised if that were true and from the same designer. The Goodholm Mansion was on ‘display’ for many years at the OKC Fair, which I toured and took pictures. Sadly, it has been moved and used as a private residence in OKC. This stunning, immaculate turn of the century home in Dunedin, a city on the southeast coast of the South Island and home to the University of Otago, has beautiful views of the harbour, a lovely garden and a guest house as well. It is a Deadline Sale so I don’t know what the price is. I like both of these houses, but I really love the first one! I want to live here in the worst way. I wouldn’t change a thing! Both are super beautiful but i have a bigger preference for the second one because of all the unpainted wood, stained glass doors/windows. great finds, thanks for sharing! Since there was a house from Paxton, MA in the past week, here’s another. Greek revival, nice manageable scale. Paxton is a nice little town, a bedroom community for Worcester. Prices never went insane because it is a tough commute to towns east of Worcester. Now listed as auction with starting bid of 180k, down from 210. I don’t think it’s a foreclosure, just trying to move it is my guess. An 1818 cape in Paxton for 158K. Could be cute again. Street view shows there was a picket fence a while back; wonder if the road got widened recently, as new pictures make the house seem closer to street. I have fallen hard for the Gothic Revival! But, alas, I seem to be 5 million short of the funds to purchase it. Seriously, it is the stuff of dreams! Wonderful house! Kind of Gothic Revival meets Greek Revival inside, pure Storybook Castle outside. Full of texture & variety throughout. Wow! What a wonderful old place! Stunning! I like the Mid Century look of this one. The Price is 89,000 Its in Laurel, Mississippi though Could be Your new “Home Town”. Looks like an Eichler (or a local copy…). Any MCM specialists have an opinion? Super cute house! I love Mid-Century Home’s and this one is a deal! 1. Linville Falls, NC, c. 1890s; $545,000: A recently-renovated farmhouse on the hillside above Linville Falls. It’s less than an hour’s hike by trail to the waterfall so it’s a highly in-demand Airbnb rental, apparently. Despite the quirky rustic decorations I still think it’s rather nice. The listing seems to use pictures from the airbnb listing so they’re almost as grainy as the unpainted wood! 2. 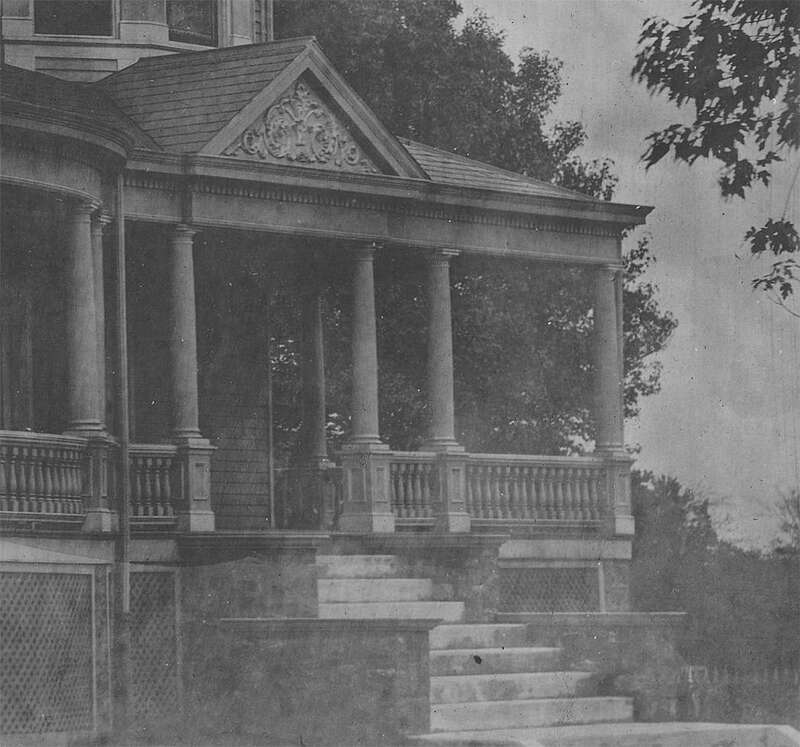 Morganton, NC, c. 1900 (the date on the listing seems to be too early); $425,000: A colonial revival that has sadly been encroached upon by new development, but has obviously been cared for by its owners. I very much like the original bathroom with his-and-hers sinks although the other one has been updated and excised of character. 3. Morganton, NC, c. 1900; $475,000: I’m not sure whether this one has been shared here already or not. Even though it’s been updated quite a bit, the kitchen and other rooms aren’t as heavy-handed and overtly HGTV-like so I don’t mind it as much. 4. East Bend, NC, c. 1920; $339,900: If you look past the aggressively quirky and charming decor this home has much of the original wood intact, and the yard is quite large and lovely too. It’s an easy drive to Winston-Salem. And, to finish it off, a pair of charmingly old-fashioned homes from 1932 and 1947. I could easily live here. I love a house surrounded by ferns, with open land and woodlands. Beautiful stone house with gothic peaks and decoration. The interior is a bit polished, but pleasant and there are a number of original details to enjoy. A triangular maze of some interesting spaces. Reminds me of the book Woodstock Handmade Houses, and is probably of the same ilk where folks were experimenting and branching out from the norm that was the Post war suburbs. The realtor calls this home part of the Design/Build Movement, so I had to look that up and came up with this: https://riversonghousewright.wordpress.com/about/the-bankruptcy-of-the-designbuild-movement/ I would have to spend some time with that. I would love to see more inside shots, but the mix of old black and white photos and a few seemingly current or new shots is interesting. Middlebury is a beautiful college town. Beautiful stone exterior. Modern kitchen that does not seem to me out of place in this old home. I am curious about the wood cook stove as I have not seen one like this. It looks like a later model when we were on the verge of leaving the wood fired era. Lovely grounds on 61 acres with many original features within the home including large cook fireplace. Tremendous old home set on 238 acres of agricultural and wooded land. …on the National Register of Historic Places not only for its superlative 1843 Greek Revival residence but for its continuous stewardship…Starting in the 1770’s, Brookside has contributed significantly to the development of Vermont as an agricultural leader with its Merino sheep and Morgan horses. It continues its heritage today with its Belted Galloway beef and breeding stock. The Pyramid House is deeply, deeply fascinating, and I hope it is included on this site if only because it was part of such an interesting (if short-lived) architectural movement! I’m optimistic that it will continue to be preserved, if only because it’s SO unique that it would only attract buyers interested in maintaining its eclectic elements. The other homes are wonderful as well. I’m somewhat jealous of New England – When I try to look up older homes in my state it often feels as if there are few that’re preserved without being renovated or “upgraded” beyond all recognition. If you have an archive of old Antiques magazine, they did a feature on the Orwell, VT house back in the 1970s I think. Fabulous furnishings, and the attic used as an enormous library. The gold paper in the front hall was said to be lining from tea shipping chests. The structure in Clarendon VT must have been separated from total package. Interesting presentation of total property. What fun it was to peruse your finds! You always do an amazing job of unearthing these nuggets. I tried, but failed, to wade through the entire architecture blog post about the build design movement, but did get far enough to see that the pyramid house is identified as the Sibley house. Based on other examples of this movement in the article, the Sibley house is one of the more successful and is more pleasing to the eye. Meanwhile, The first and last homes in your list were my faves. I appreciate your kind words. I too failed to finish the blog, at least on my first try. I will have to look into the Sibley house. I too loved seeing your VT postings…..thanks. The Clarendon youTube presentation is charming as well. Kimberly62, you have found some lovely houses, but I most appreciate the ones with the lush green landscapes – especially at this time of the year! These are the types of houses I will spend hours looking at—all wonderful and interesting in their own way. Your postings always resonate with me. I have been fascinated by the Middlbury house for some time but can’t find out much about but agree with your assessment that Middlebury is a great college town. The spring house at the hotel is R.A.D. RAD! Sure wish they’d have included an exterior shot of it! God bless somebody for taking care of and preserving it. Could picture 67 be the inside of the springhouse? I just love the decorative fence! I’m too lazy to count. 😉 Link above to original spring house pool. That the iron hasn’t completely rusted away at it’s base is testament to MANY, (if not recent), years of care. Sooooo rad. So many great finds! All extraordinary!! Love the Cavendish house, the Orwell greek revival (the floor with rhombus pattern! ), and this pyramid house, the views!! Cape Cod, Massachusetts. Built 1825 (or earlier) and in original family for 170 years! This sprawling home home is on historic Route 6A (Main St) in Barnstable Village. Fabulous location- Walk to beach or shops/restaurants! Charming period detail, updated for modern living and spacious rooms. The first floor boasts an open floor plan that features an updated kitchen and dining area surrounded by windows that flows into an inviting family room with gas fireplace. A bedroom with full bath, lovely living room, formal dining room and powder room complete the first floor. The second floor has a full bath with stacked washer/dryer, a cozy sitting area and three bedrooms. The walk up attic has been transformed into a fabulous bedroom with gorgeous and beautifully crafted wood paneled walls and wood ceiling. A separate barn completes this special property. Beachy and lovely with some really nice antique and contemporary elements. Thank you for sharing. 🙂 The kitchen is a knockout; but I’m a sucker for clerestory windows. The attic, nautical re-do is pretty cool. Imagine the cost! Those wiiiide plank floors up there are like butta! WOWEE! Sure could comfortably live here. What a gorgeous home, there’s really nothing I’d change, I’d even leave the can lights. I think I love this house more than I love my husband. But the mullioned windows are an odd touch. Thank you very much. I didn’t know that and this house is literally the first time I have ever seen that feature on an American house from that period. Amerikiwi, you might check out the chapter on Postmedieval English houses….1600-1700 in McAlester’s A FIELD GUIDE TO AMERICAN HOUSES. The leaded glass casements in present restorations are all reproductions. Also, as is often mis-named, the pane divisions of windows, whether wooden or leaded, are muntins, not mullions, which are the vertical members dividing sections of sash. Usually I’m skeptical of houses in the US which claim a build date circa before 1700; but this one clearly fills that bill: clearly. 1637 though? I am no expert on houses this early. Wouldn’t that make this one of the very oldest extant homes in North America? Cheers Charles. Thanks’ for the interesting post. Not for me – but NICE. Very hard to definitively date them that early I believe. How much scrilla will that test run you? Two grand, plus a few holes drilled all the way through your beams the width of a dime. And almost every result I have heard about is that the house is far younger than anyone suspected–e.g. the log cabin enshrined as Lincoln’s birthplace couldn’t have been constructed until Honest Abe was in his 30s and residing in another state (the one exception I can think of is the Fairbanks House in Dedham, MA). If I bought this Wethersfield house and every local history gave it that 1637 date, I’d let sleeping dogs lie. Especially for the $2K test! 1637 sounds and looks good to me. Very cool house! What fun it would be to live there. It was a big shocker to see the recessed lighting in the last few interior shots. To start off is a nicely maintained 1914 Colonial Revival in Watertown, Ct listed at $385k. It retains a lot of originality and is 6 bedrooms and 5 1/2 baths. Next is a very nice Italianate house in Cornwall Ct that is listed at $249,900. The build date given is 1800, so maybe there is an older part to it, must have been added on to or remodeled in the 1860’s or 70’s. It was damaged in a fire, but the outside has been restored and it’s awaiting an interior restoration. This 1963 brick ranch in Bristol, Ct is listed at 299k. It appears to be set off a long private drive on almost 7 acres. The back of the house is what really opens up, and it appears the lower level was never finished off. It almost has a Frank Lloyd Wright feel to it with it’s broad eaves. Last but not least is this architect designed 1952 ranch in Danbury, Ct listed at 309k. It’s already under contract, but I wanted to post it, because of it’s time capsule interior. It’s a nice look at a 50’s upper middle class life. Nobody better touch that tree branch wallpaper in the dining room! These are all great but the Danbury ranch takes the cake! Talk about a plate of glass! Wow. 🙂 TY Don. Ha, Rosewater. I can’t imagine how much it might cost to replace that window. That window is amaaaaazing. The entire house is appealing, but the window is a knockout! Here’s one which I’ll wager just John already posted. I noticed it this week by random, and thought my fellow mid-mod and FLLW lovers would enjoy, if they hadn’t seen it already. It has a very Frank flair since it was designed by a Taliesin fellow. It’s in limbo, so possibly a deal to be had there by a liquid buyer. TVplay icon at top right does the work. That Kinderhook home is one of the most beautiful homes I’ve ever seen… speechless. Thank you Rosewater for sharing that. You are so welcome peewee. 🙂 I couldn’t agree with you more! Great presentation on that Kinderhook house – I’d almost forgotten how gorgeous it is! Awesome MCM in Barrington. Thanks for sharing! While you had me at Frank, Rosewater… that last picture of the approach to the house is what sells me on it. That is so cool! Smart agent. That Longmeadow house is amazing. I could definitely see living in that. My God I’m in love with those fireplaces in Longmeadow. That stone work is symmetrically sublime. The floor level fire boxes are soooo nice. Gorge! Clipped for my collection. That house is very early for International. Interesting a-typical contrast between design and materials. I know that they’re not similar really, but the Longmeadow house seems like it could have been influenced by the Gropius house from a few years earlier, not all that far away in Lincoln. At the very least, the owner would have known about it. Is that a round radiator, under the stair ?? Nice ! The listing agent calls this “Federal Style” but it is definitely not that. I’m not sure what to call it — early 20th century colonial revival with double-decker Greek Revival porch? It’s definitely a stylistic mutt, but I like it. I think Neoclassical would cover it, and a nicely proportioned and detailed house it is! Never been to Mobile, but the Old Dauphin Way Historic District has to be one of the most architecturally diverse in the country, with 1900+ houses built over a century. I too would call this house an example of the popular turn of the last century Classical Revival style. However, it was far more common for houses of this era to look almost identical to the Greek Revival Temple type houses from a half century earlier; this home departs from that house form slightly with a double galleried (double decker) porch. My guess is that a local architect may have designed the house. The interior with Colonial/Classical motifs is very typical of the period. Nice house here which I find appealing. Thanks for sharing. In case anyone wins the lottery this weekend, this might be how you could spend the money: Oakdale, an 1838 16-bedroom mansion in Woodbine, Maryland, between DC and Baltimore. Yours for $10,250,000… unless I am the one with all six Powerball numbers. Excellent property. To turn a phrase attributed to the Duchess of Windsor (or, perhaps, Babe Paley), a fine house can never be too expensive or have too much square footage. I want those bathrooms. Original subway tile, original sinks!! Lovely house, but I’ll need Lotto winnings. For those who don’t have $5 million to spare, here’s a perfectly respectable McKnight shingley house that “needs a little TLC”. What Thin Layer Chromatography has to do with it I don’t know. Has a nice-looking barn out back. The McKnight Historic district in Springfield, Massachusetts, has long been an improving and remains a largely intact Victorian era neighborhood in that town. It’s showing off market currently so someone must have jumped on it as even for the McKnight district, it was at the lower end of housing prices there. Thanks for sharing. Parsonsfield, Maine Federal with 84 acres of land. Great views, tennis court, super staircase and lots of fireplaces. Parsonsfield is a nice quiet town near the NH border and lakes. This home also is close to the Province Lake Golf Course. Cincinnati Ohio, 1959,$229k, holy cow! The kitchen and bathroom is heaven! Very well styled! They have furnished it perfectly. Love it! Except for the vertical blinds, I’d leave all as is and bargain for the furniture. I remember every aspect of this wonderfully preserved house…..love it! Well styled is a good description. Nicely done house. The formica table in the kitchen grabs me — I love that it must have been the coolest thing in the 50s. I am in love with this one. The rooms are warm and inviting. Love the attic floor. Now all I need is a winning lottery ticket. Very nice! I like everything about it… especially the kitchen. I hope it survives the next owners! Fairly high finish for a garage roof! Did not realize taxes were so high there. College town. The Jello mansion. The listing says the reserve is $100K (if I read it correctly). Seven acres in the grape arbor region of New York and a seven-thousand sq. ft. house. Beautiful exterior! Kind of odd having an online auction with no pictures. Preview for this house is today Feb 10th and again on the 21st. Clarksburg, WVA, small, 1909 church, $26k, two acres. Would make an inexpensive home for retiree who wants small town living. No interior pictures. Does have new roof and electric panel. 1933 Spanish style, Pasadena, CA. Home has been in the same family for generations. Hardwood and tile floors, beamed ceilings, stained glass windows and original bathrooms. $2,950,000. Wow, dazzling. From tilework to ironwork to glasswork and woodwork, everything superb. The old tiles make me want to grab them & run! The property and views equal the quality of the house. Historic family getaway shingled house on the edge of water, what could be more fun in summer…?? Lovely almost 4 acre property with a VA Landmark house. I especially like the cottage. A couple of odd birds in Chicago this week! First, this 1914 two-flat in the Park Manor neighborhood on the South Side, $109K (listing build date is incorrect). This one’s notable because it was the first Chicago house of Al Capone, who moved his family here in 1923 not long after arriving from New York. 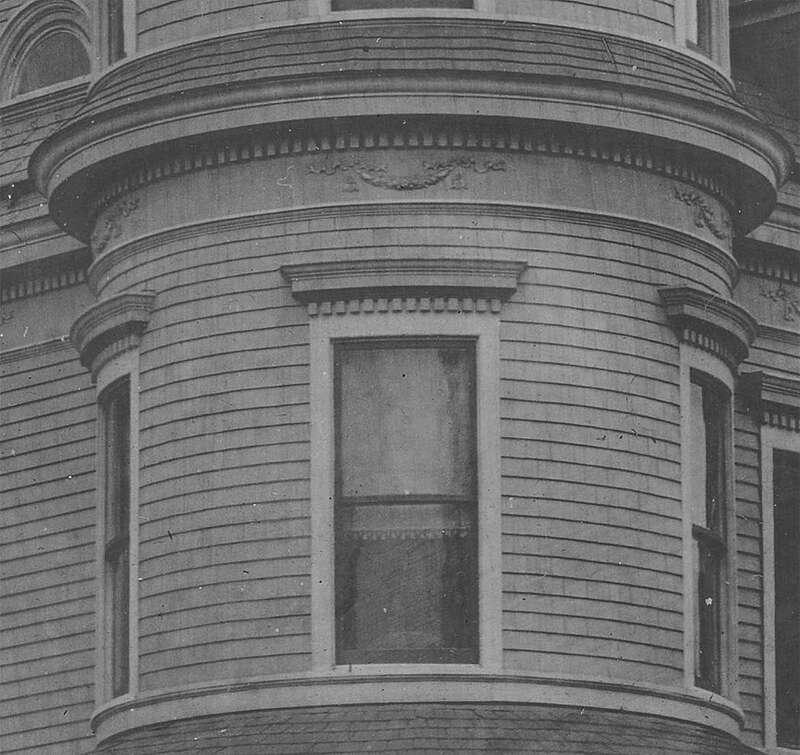 His brother Frank, killed in 1924, was waked in the first floor parlor, and the building changed out of Capone family hands in 1953 after his sister sold it. By all accounts, Al wasn’t here much due to business. There was a rumor that he had a tunnel from the basement to the garage but that’s highly unlikely (Capone tunnel stories abound here in Chicago). It’s a quiet, aging neighborhood with houses much like this one on all blocks. On the other side of town, in Rogers Park, this magnificent 1918 house, $400k, seems to have some significant problems (perhaps hoarding?) that prevent anyone from seeing inside, according to the listing. There looks to be water damage in one photo. Hopefully, though, a new buyer will renovate or restore instead of demolish. It’s a half-block from the lakefront and across the street from Frank Lloyd Wright’s Emil Bach house. 1920 Craftsman Bungalow, Loveland, Colorado… $525,000. A late and well-maintained example of the style retaining many original features. c. 1875 Italianate, Rockford, Illinois… $19,000. A modest home with lots of nice authentic character and original detailing for the money. Needs work, but the potential is great as the house retains an unusual amount of architectural integrity. The poor Rockford, Illinois house is so sad. definitely has potential. 1900. “Braeburn.” A beautiful estate in VA. I think I know what the gadget is for in photo #31, but what is the technical term for it? Technically it is known as an annunciator. More frequently it is referred to as a servant’s call box. That house (lol, house) makes me curl my toes, it’s that good. It’s unbelievable that it’s essentially as built in 1560, owned by the same family until 2004. No kitchen photos though – LOL. Maybe they don’t need a kitchen? 😀 If I were able to live in something like that I’d hire an Italian chef. That means using the garden to work off all the calories I’d be eating. Price not listed. But I’m pretty certain I can’t afford it. Those fresco’s are amazing. This is what dreams are made of! I just added the Cornwall home this morning. The interior isn’t so bad but maybe they didn’t show the “fire” parts. 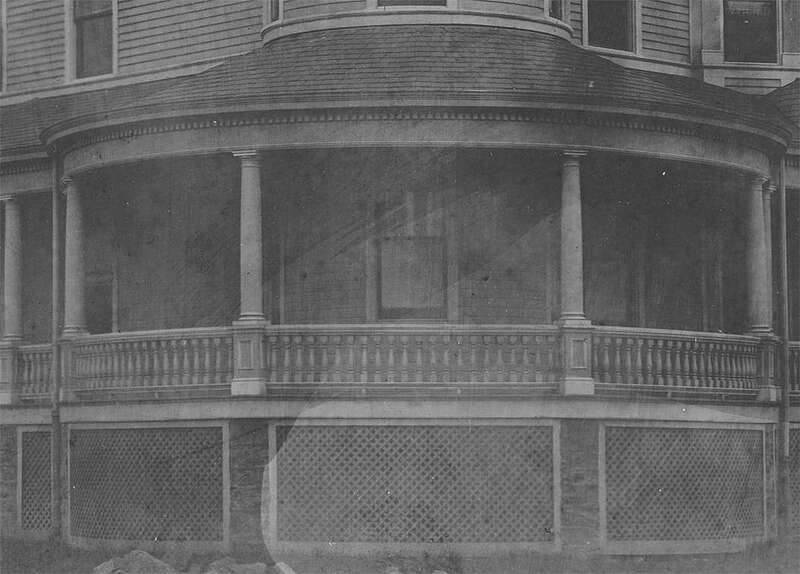 The Frederick house has beautiful bones; it would be a big waste not to restore it. The listing explains nothing — was it used as a school? Sad, what’s been done to the poor beauty. I hope somebody comes along to give it help. Could your Baltimore-post reason be something like How Not to Dress Up a Listing? lol. The marketing for the house in Baltimore is just plain creepy. I hope this is not a trend. I had to see what this was about. My favorite pic is the one where he’s peeking through the window. When I read “…this old place by some guy named Palladio…” I was dumbstruck. Is it possible that there is anybody who loves architecture who has never heard of Palladio, arguably the greatest architect of all time, who since the 16th century has influenced most houses of kings down to squirelings in countries all over the world, and without whose ideas what we know as the classical architectural styles of Britain and the United States wouldn’t exist. The Veneto is rich with his houses and others influenced by his ideas as they were built to impress but with economy (rubble stone covered with stucco) since they were country seats, near a waterway for easy access and movement of products, and size to accommodate the family when visiting in the country and to store grains and merchandise most often in attics and parts of the cellars (since the kitchens were also located there) but also in the side wings called “barchese”. The listing doesn’t mention Palladio but I recognized it instantly from Arch. History 101. One of the world’s great houses. In short, the villa Kelly posted was certainly influenced by Palladio, but this particular Villa Emo is credited to Vincenzo Scamozzi, who actually finished several of Palladio projects after the latter’s passing in 1580. The proportions of the posted house seemed a little off IMO. Thanks’ John. OK, wrong V. Emo but Scamozzi did great work as well! I think that phrase was intended as ironic, at least that’s how I read it. The work of Andrea Palladio (1508 – 1580, Venice) architect of the eponymous style was much admired by English nobility and landed gentry. They returned from their Grand Tours of the continent with ideas, drawings and books, and built the Palladian structures that became a pillar of the Georgian era, and influenced styles in North America. 1976 Organic Modern, Boulder, Colorado… $1,395,000. Designed by architect Charles Haertling who was influenced by both FLW and Bruce Goff. Well-maintained and in near-original condition. The interior is definitely challenged in terms of vertical wall space! It would be fun to see photos of how it was furnished originally. I guess the views compensate for the shortage of artwork-friendly surfaces. The walls in the basement (bedroom level — not shown) are probably a lot more conventional. I term these houses, “architectural sculptures.” I’d have a difficult time adapting to one, but do appreciate them as structural art. Found the photo of the adirondack chairs a bit of unexpected counterpoint. Number two is a very rustic 1737 stone colonial on 136 acres also in Fort Plain. This one is asking almost two mil though. Thanks for posting the Brower farm. It’s over-improved but still a great artifact of colonial settlement in the Mohawk River valley. Good stuff! Thank you. Love the vintage work segmenting the third floor in the stairwell. Cool. Smart. SURE wish the agent had included a shot of the stove peeking out from lower right in the service pantry! MN. Lovely town of 14,000 in Lakes Region, West Central MN, about 60 miles SE of Fargo. 1919 building in a vibrant downtown. The bakery did a brisk business and was much beloved. This would be an easy business to take over. Apparently the storefront itself is very unique, but I cannot recall exactly why. The storefront is unique because of the Pigmented Structural Glass (Wikipedia) https://en.wikipedia.org/wiki/Pigmented_structural_glass made by a number of companies beginning in the early 1900’s under different product names such as Vitrolite. No one is making this structural glass anymore (as far as I know) so salvage sources supply the limited amount still available: http://www.vitrolitespecialist.com/ I recall once seeing a 1920’s former jewelry store clad with a dark cobalt blue glass front with shiny metal Art Deco style trim. Very classy. Vitriolite! That’s it! Thank you John! $350,000 in Saint Paul, MN. Was about to post this but found it’s contingent pending inspection. Unpainted woodwork, amazing kitchen with Jadeite sink and bathroom with Jadeite fixtures. This was just listed and already pending, doesn’t surprise me. Totally in love with the kitchen and bathroom. Not a house for sale, but a story about a restoration. Years ago (about23! )I was looking for a new old house as I had outgrown the one I had restored in Racine Wi. I thought this one was a little too far away from my work to drive everyday. It was in VERY bad shape at the time, and I hoped it wouldn’t get torn down 🙂 . Luckily someone saved it! Makes me so sad to see a house “transformed” in this way. And it’s just a flip selling for double the price a year and a half later. It’s one thing to gut the inside claiming nothing original is left which is lie since, while it’s not the grandest house, there are clearly still moldings, fireplaces and details in the before pics. But it makes me extra sad to see all the character stripped from the exterior. The interior reminds me of a San Fran Spanish Revival, no longer on the site. Had a good many original details and they gutted it and turned it into the same thing as that one. Thought I’d check up on another old post to see what was happening, not good news. Haverhill, New Hampshire restored 1795 Federal Period home, for sale by owner at $645,000. The link goes to a dedicated home website lovingly created by the owners with video and photos. Comments welcome! Love that home! Did you know it was on OHD? Are you the owner? I’d like to ask you something about it if you are. Didn’t know it was already here! Probably an automatic listing after the owners listed it on FSBO. I’m not the owner but did most of the photography and all the video and website programming. Feel free to write me and ask any questions; I know the property very well (not as a realtor) and can forward your questions to the owners if I don’t know the answers. Here is a comfortable family home in France: price Euro 66,000.00. My absolute favorite style of house, 1895 Romanesque revival! 😍 it’s on the national registry and only 280k, I say it’s a steal for that stairway. Oh and look just around the corner from my last post, another Romanesque revival but from 1983. First of all I’m a sucker for original Lighting which this house seems to have an abundance of, but then that grand curved staircase! Even still has an original bathroom sink. And did I mention that it’s right across the street from a freaking park !? That is an amazing house! I wish the lot were larger, and that it had original bathrooms, but aside from that, wow, oh wow, oh wow that entry hall and staircase, the curved cabinets in the pantry, the beautiful stained glass everywhere, the ceilings, the floors, the doors, the peaked arched doorways in the attic, the basement, wow again! The kitchen needs a makeover (how can anyone cook on that cooktop with no landing space on either side of it? ), but aside from that, I’d take it!! It would be like living in a museum. What a great, fantastic house! And not just any park, it’s Lafayette Park. Do a street view. This is an auction but man I am so intrigued! I REALLY want to see the inside! Some great houses around it too. The present owner has loved and cared for this Pennsylvania farmhouse for 41 years. The blue rock stone original structure was built over the current water supply, an artesian well, and dates to 1760. The well continues to provide all water needs of the home, including the geothermal heat and cooling system. The second story brick section was added in 1843 and the north frame section about 50 years later. The final addition was added in 1988. Connected by a 2 story foyer is a separate studio/office space situated above the 2 car addition overlooking the yard with floor to ceiling windows and skylights. A great space to be creative and productive with lots of natural light. Character and charm blend with stylish updates in the bright, airy kitchen with quartz counter tops, recessed lighting, tile backsplash and lots of cabinet space. Four spacious bedrooms with deep window sills and original wide board pine flooring.